Do you enjoy spending time on your porch during the summer but want a bit more shade? You can enjoy the beauty of your property and never sacrifice your comfort by having motorized screens installed for your porch. Motorized power screens can offer a variety of benefits to homeowners. 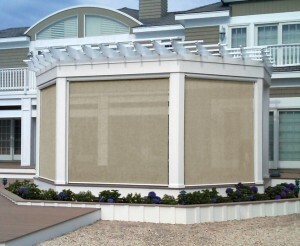 Here at Carroll Awning Company we can design fully customized motorized screens for your home. -And wide range of fabrics, styles and colors to complement your home exterior design. You can’t go wrong with Carroll Awning Company’s motorized retractable screen systems. Our motorized screens will increase your home value and improve the energy efficiency of your property by blocking up to 90 percent of UV rays and reducing air conditioning expenses by 40 percent. Let Carroll Awning Company help you design a cost-effective solution for your home today.